Over recent years, technological advancements have allowed employees more dynamic ways to work without physically be present in an office. There are many benefits to modern work arrangements. According to MarketWatch, 50% of the workforce will be remote by 2020. Flexible work arrangements are becoming a more desirable requirement of employers, but how do individuals stay on task when left to their own devices? Whether you work remotely 100% of the time or only some of the time, these 5 tips will help you stay on track when telecommuting. Having so much flexibility can tempt unstructured remote work. Maybe you sleep in later or do tasks on the fly without concrete plans. This can lead to chaos, procrastination, and disorganization. Even though you are telecommuting, it is important to adopt daily routines that create structure for your work days. Some people work better in the evening and others better bright and early. Determine what times of the day you feel most productive and plan a regular work day around this. In addition, make a point to get ready in the morning. This doesn’t necessarily mean putting on full business attire, but just enough to feel like you put some effort in. Getting ready helps set the tone for a more productive work day. The key is to do things at the same time every day. Get up, get ready, eat, and start/end working at the same time every day. Adopting structure will help you stay motivated. It is essential to have a dedicated workspace, which traditionally is a room or cubical in an office building, but this principle applies to remote work too. Try to create separation from your office life and personal life to avoid distractions that cause interference. For example, you may try and set up shop in your living room to get work done but find yourself binge-watching Netflix without making any progress on your work assignments. For best results, create an isolated space that allows you to give your undivided attention to work. Have supplies and technology readily accessible that are necessary to successfully carry out your duties. 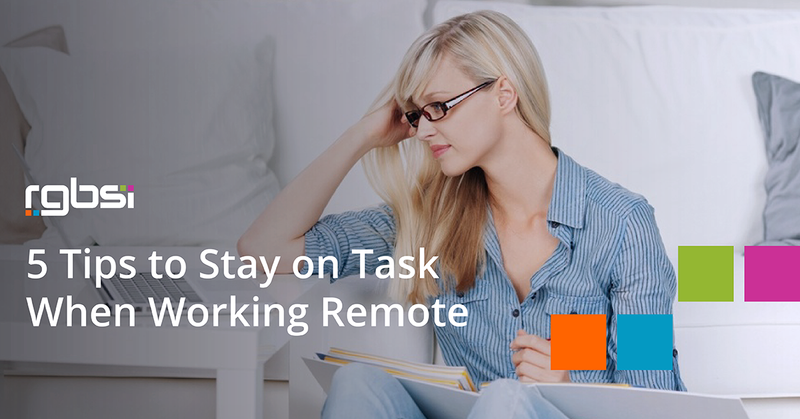 The more your remote workspace feels like “work” the more motivated you’ll feel to do just that. Outlining tasks that you want to accomplish within the day helps you track productivity. This includes scheduling time for work-related tasks and personal errands throughout the day. This will help you stay organized and provide a visual tracker of your work progress overtime. Schedule tasks in time blocks, accommodate conference calls and meetings in your daily plan, and allow time for personal errands. There are many task management tools readily available to help automate “to-do” lists and create project plans. For example, Asana helps categorize tasks by project and helps you stay on top of deadlines. Telecommuting can become lonely due to the lack of social interaction to that of a traditional office. All coworker interactions tasks place via email, chat, and phone. That is why it is important to make a conscious effort to combat this. Schedule some time to meet up with other professionals or plan activities with family and friends. This will help counteract the feeling of isolation and keep you balanced with time away from the computer screen. Working from home can blur the lines between business and personal time. It can be tempting to operate an erratic work schedule with so much flexibility. If you don’t have a cutoff point, you risk overworked fatigue and burnout which can result in lack of concentration in the long run. Setting designated start, break, and stop times for your work hours helps establish boundaries. Your brain will thank you for allowing it to adjust to a regular schedule and operate consistently. You will feel less stressed and enjoy a healthy work-life balance. At RGBSI, we provide engineering, IT, and administrative job opportunities for contract, contract to hire, project based, and permanent positions. We have established relationships with top companies in engineering and IT industries around the globe. The opportunities are endless for engaging in different career paths. View our job portal to see all of our current openings.